This Asparagus Carbonara channels the famous pasta dish. The sauce is a simple egg custard, flavoured with Parmesan and bacon. 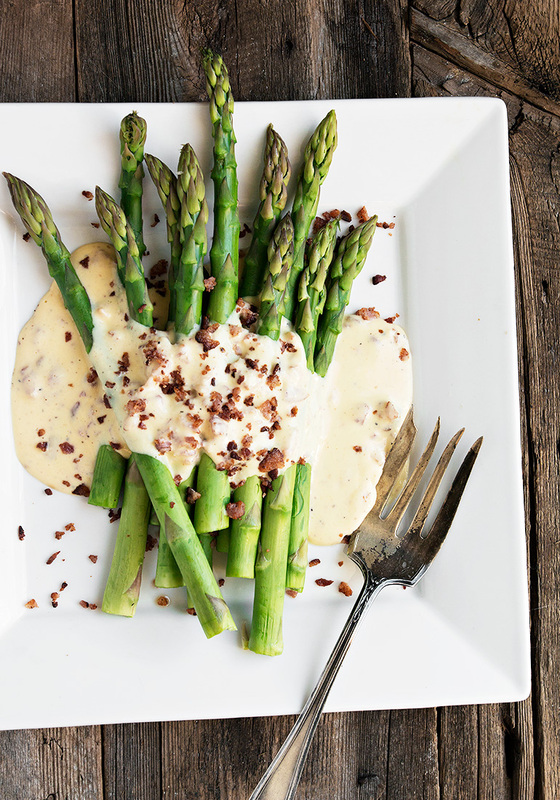 An easy and delicious way to enjoy asparagus! If you’ve ever enjoyed pasta carbonara, you will have a great idea of how this lovely sauce tastes! It’s my new favourite way to enjoy asparagus! 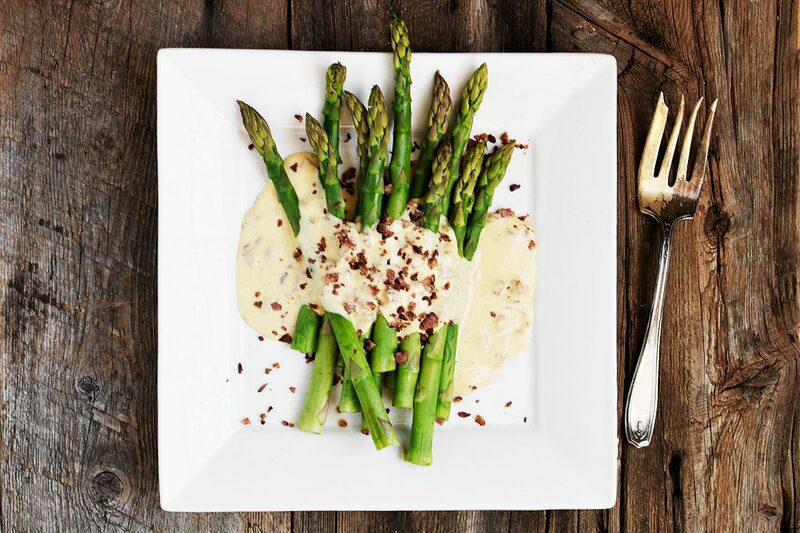 The simple egg custard is flavoured with lots of Parmesan, bacon and pepper and spooned over wonderful Spring asparagus, for a super delicious side dish. 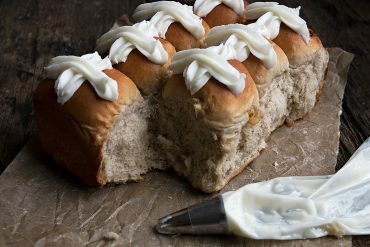 There isn’t anything difficult about this dish as long as you follow the simple rule of never, ever letting your custard boil. That’s a fast track to scrambled eggs :) So be patient and you will definitely be rewarded. Check out the Cook’s Notes for more tips. 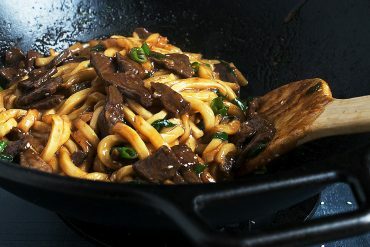 As noted above, this is a simple dish to make, as long as you are patient. There are two places where this is especially important. 1) When you are adding the hot milk to the egg mixture, you definitely want to add it literally a drop at a time at first and to whisk constantly as you add it. Increase only to a slow stream. The idea with this process (called tempering) is to very slowly bring the temperature of the eggs up to the temperature of the milk, so that the egg doesn’t cook and curdle. 2) Stirring the egg/milk mixture to thickening is a bit of a slow process when done over low heat, but it really does make it easier not to over-cook and curdle it. Resist the urge to increase the heat or you may be sorry. Consider it stirring therapy and just go with it :) It will take about 10 minutes of stirring. An instant read thermometer is a helpful tool here to gauge where you’re at. The magic thickening will happen at about 180F. As noted in the recipe, you can make the sauce ahead and refrigerate. Simply re-warm slowly (over low heat) in a saucepan. Microwaving is not recommended, nor should the sauce be allowed to boil when re-heating, as it may curdle. I haven’t specified how to cook the asparagus. Simply use your favourite method or use the handy guide below to cook it up! Roasted Asparagus: Preheat oven to 425F. 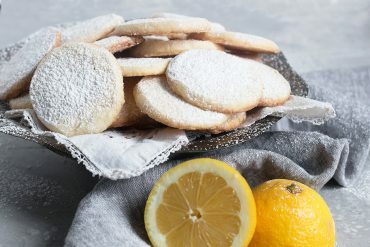 Line a tray with foil or parchment paper. Lay the asparagus onto the tray in a single layer. Drizzle with olive oil and season with salt and pepper. Roast for about 10 minutes, or until just tender. Steamed Asparagus: Place the asparagus spears in a steaming basket with a little boiling water underneath. Cover and cook for three minutes. Boiled Asparagus: In a wide pot, boil a few inches of salted water. Add your asparagus. Cook at a vigorous simmer for 2 to 4 minutes, depending on the size of your asparagus and how tender you like it. Pan Fried Asparagus: Melt a pat of butter in a skillet over medium-high heat. Add a splash of olive oil. Add asparagus and cook for 10 minutes, turning asparagus regularly to ensure even cooking. Microwave Asparagus: Place spears in a single layer in a glass microwave-safe plate. Cover loosely with plastic wrap. Microwave on high for 3-4 minutes, depending on thickness of asparagus. 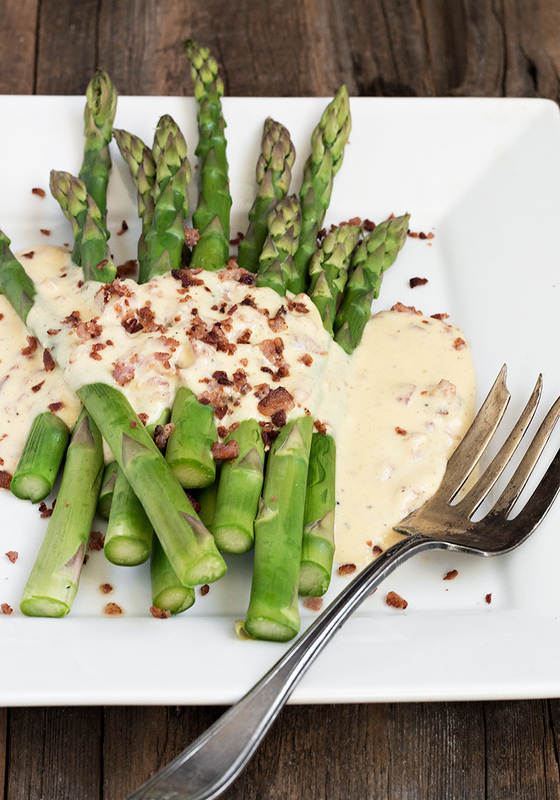 Delicious Parmesan and bacon sauce, in a lovely smooth egg-based custard, spooned over cooked asparagus and garnished with bacon. Cook bacon and remove to cutting board to cool slightly. Finely chop and set aside. In a medium bowl, whisk together the egg yolks, Parmesan cheese and salt and pepper. Set aside. In a medium-sized saucepan, heat milk to simmering over medium heat. Remove some of the hot milk with a large spoon. 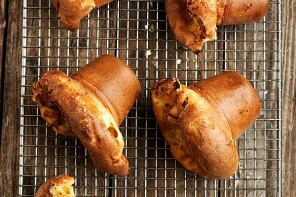 Very, very slowly (a drop at a time, at first), add the hot milk to the egg mixture, whisking constantly as you add it. Add another spoonful of the hot milk in the same way, whisking constantly as you add it. Add one more spoonful. Once the third spoonful has been added, add all the egg mixture with the hot milk back to the saucepan. Reduce heat to low. Cook, stirring constantly, until mixture thickens (about 10 minutes), BUT DOES NOT BOIL, as the eggs will curdle if it boils. If you have a thermometer, this will happen at about 180F. Remove thickened sauce from heat. Stir in 3/4 of the chopped bacon and the additional 2 Tbsp. Parmesan cheese. Spoon over hot asparagus. Garnish with remaining chopped bacon. If making the sauce ahead, allow to cool, then cover and refrigerate. To re-heat, do not microwave. Add to a small saucepan over low heat and raise the temperature slowly, just to serving temperature. Do not boil. I can’t get enough of spring asparagus, and this is such a lovely way to enjoy it! This is brilliant Jennifer, as usual. I might also be tempted to chop up the asparagus and toss the whole thing with fettuccine…when I’m craving carbs! Thanks so much Sue and yes, absolutely would be great with pasta! What an amazing idea Jennifer! 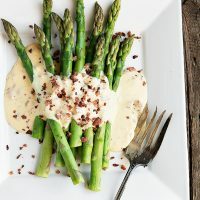 We love carbonara sauce and I’ve never thought to top my asparagus with it! Delicious! Thanks Mary Ann. 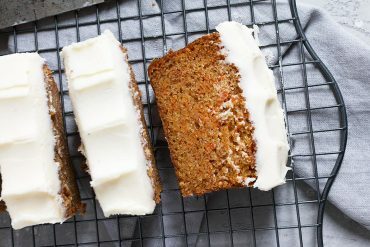 It was inspired by 3 leftover egg yolks in my fridge and was more delicious than I even imagined. It really goes so well with the asparagus! 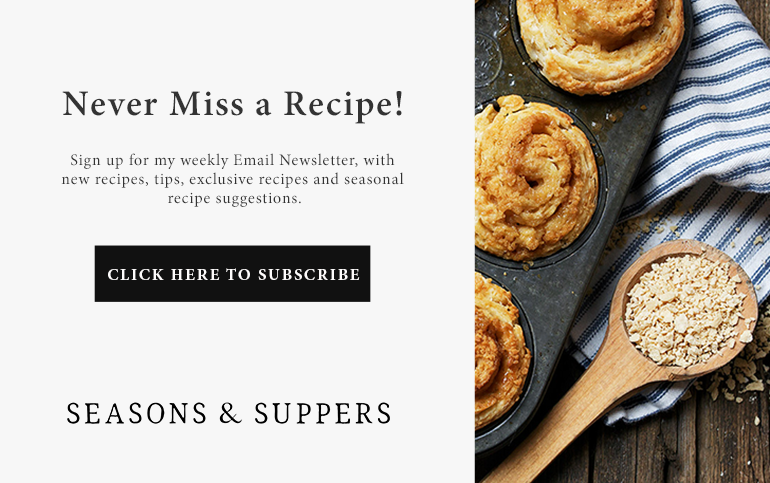 I love to make sauces like this – and especially love to eat them! 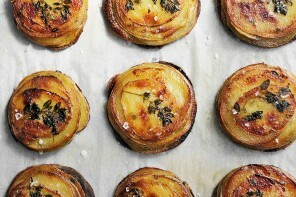 We adore asparagus but get into a rut eating it oven roasted at each meal. 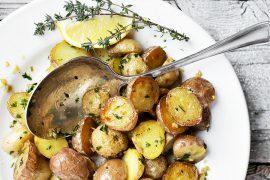 I need to try this beautiful sauce and will have a hard time not drizzling it on everything on my plate :) Have a blessed and wonderful Easter Jennifer! Perfection! That sauce is everything! 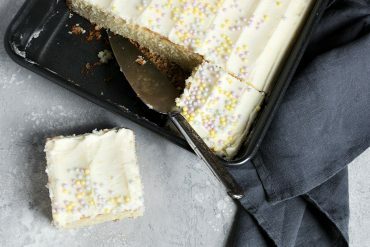 I just want to eat it with a spoon! ;) The asparagus is a wonderful accompaniment! Thanks so much, Annie :) It really was good enough to eat with a spoon. Went so well with the asparagus, too! 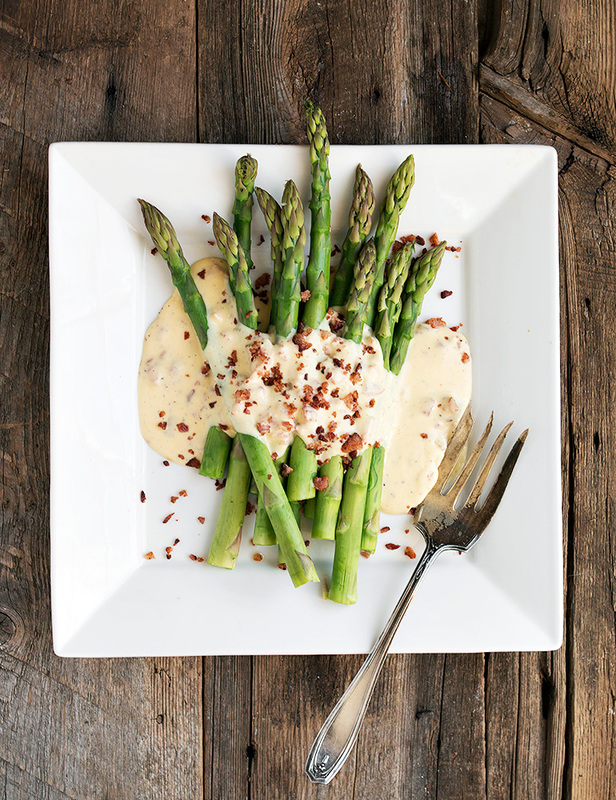 Asparagus is one of my favorite veggies and then topping it with that delicious sauce…yum!